BESIDES the opposition in South Africa who might only be seeking to make political gains out of the gaffe by President Jacob Zuma, everybody else seems focussed on the ‘Malawi’ element of his unwise comments the other week. 1. He is President of South Africa, and therefore Citizen Number One 2. South Africa is part of the continent of Africa 3. 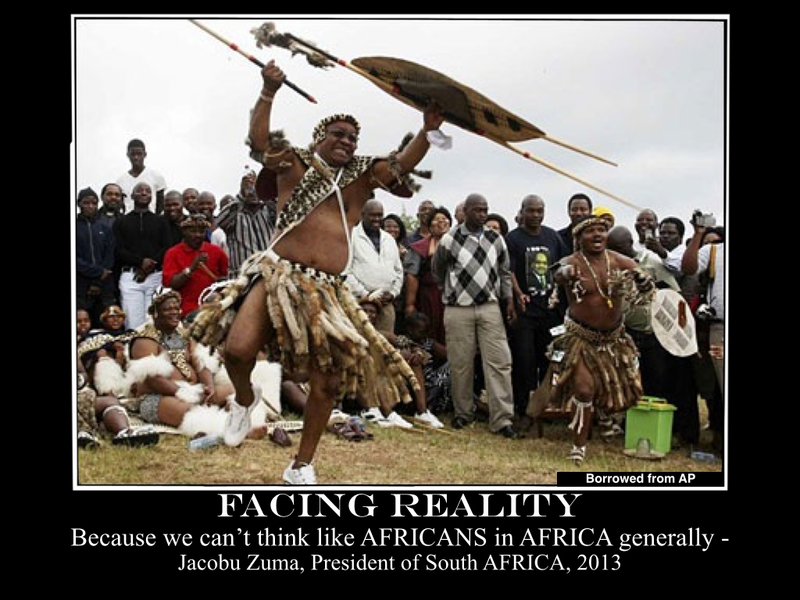 Jacob Zuma is African – generally. His comments didn’t surprise many people for two reasons: First, Zuma has consistently raised controversy over the last few years by saying and doing things not normally used as a measure of how high an individual IQ is; and Secondly, South Africans are known for referring to the rest of the continent as ‘Africa’, as if they are on their own continent. We didn’t notice it for the first few years after apartheid ended, because almost all our passports bore the stamp ‘All countries except South Africa’ for so long that we ran our own mental apartheid against South Africa. On their part, some of us suspect that they are running their own against us, and we call it xenophobia but that’s only a symptom of the problem at hand here; others call it a superiority complex but I bet there is a far more intelligent man out there than myself (and Zuma, certainly) who could argue that a superiority complex is actually an inferiority complex in defence mode. I won’t get into that because I am not that intellectual philosopher. What I will get into, though, is how weakly the whole of Africa (excluding South Africa) has treated this comment of “think like Africans, in Africa, generally”. Surely the whole of the African Union should be up in arms against Zuma for turning the continent into an idiom for something negative, bumbling, stupid, wrong, derogatory (feel free to add all the adjectives that the comment above evokes in you). How can all the Presidents of Africa except South Africa not have taken offence at the comments by our smiling jolly father of twenty and husband of (how many? ), he of the miracle shower solutions and God-knows-what other gaffes that we don’t ever get to hear of because we are in Africa? But then again, wait. Maybe it’s ME who’s thinking like an African in Africa, generally? Taking offence at light comments made in a jocular setting and perhaps delivered as part of some political satire? The event might have been the South African equivalent of that US dinner where the President cracks jokes with comedians and pokes fun at himself and everyone else? But then again, still, wait. Maybe there is something in that saying about thinking like an African in Africa, generally; does it have to do with failing to prioritise? Neglecting to plan? Being incapable of appreciating the value of time? Refusing to save now for better gains later? Blowing scarce resources on glitzy luxuries instead of the development of much-needed infrastructure? Filling up the pot-bellied bank accounts of the wealthy few in the cities at the expense of the rib-cage thin majority in the villages? Taking denigrating donations with one hand while using the other to spend on ostentation? Growing large dirty areas of dusty compounds and slums instead of well-kempt, lush gardens even in the middle of a tropical oasis? Zuma may be on to something, you know. He just might be a major intellectual, after all, out to make us face our realities. We Africans, in Africa generally. Yes – I know it’s still two months away, but we’ve had this discussion before, haven’t we? THIS is when we start planning because the ability to plan ahead and act accordingly is one of the qualities that sets (some of) us apart from the more ordinary occupants of the animal kingdom. Many things! The Christmas feast, the outfit for the day, travel upcountry, and the entire holiday season so that school fees are paid at the start of January instead of borrowed frantically at the start of February. We talked about this last year but it was late in the year, so since this is much earlier we can do better, especially at Gifts. First of all, Buy Ugandan – the advantages are obvious, but refer to our discussion around how it grows your own economy if you buy stuff made in Uganda rather than in China, Turkey or wherever. At the very least, allocate the larger percentage of your gifts to Ugandan-made ones, and a smaller one to imported gifts. Then, look for the song, ‘Do They Know It’s Christmas?‘, the 1984 Bob Geldof hit released by Band Aid to help raise funds for the famine that had hit Ethiopia that year and that branded the country as the home of famine, hunger and children wearing uncommon houseflies as jewellery. It is not just a Christmas song to cut cake and pop drinks to. If you play it carefully once a week while paying attention you should be moved to dedicate some of your goodwill to the underprivileged alongside the wife’s annual gomesi. Start now and there can be no excuses; if you save Ushs30,000 off this weekend’s salary, and November and December, for instance, that’s about Ushs100,000 you can give to a cause that will really make some underprivileged people believe in God – and that’s how to get real blessings, I’ve heard the religious say. Five people turning up at a Village Health Centre with Ushs100,000 each could change the lives of the entire village just by making the place more comfortable for the health workers to stay and work – a water dispenser here, a brightly painted wall there, ten boxes of disposable syringes, twenty boxes of disposable gloves. Ten individuals with Ushs100,000 each can buy a hospital bed landed right there in the village, or a fridge for the health centre to store delicate medicines or blood. Or they can bulk pay the electricity bill for the whole year ahead of 2014. It’s like the church tithing but while putting physical stuff on the ground that will directly change lives while you watch. In fact, it’s also insurance of sorts, because if every year we give equipment to our local hospitals using a small percentage of our Christmas spending, then we’re ensuring that during that one week in the village we have better medical care around us hundreds of kilometres away from International Hospitals in Kampala and clinics with corporate cover files. Ten well-to-do families from Kampala going back to Hoima, Kiruhura or Kamuli with a second-hand ambulance can rest assured that in the event of a party calamity their loved ones will be driven to Kampala on life support and in comfort rather than hunched up in the back of a Prado or on the end of a pick-up bed. But start with the small gifts; a stack of reading materials for the local primary school could coax a dazzling amount of creativity and imagination out of some bare-footed village kids otherwise destined for an NGO poster on the internet. I don’t know about you but I feel like an NGO even thinking about this; just like when I drive down to a village in a four wheel drive vehicle and step out of the air conditioning into the flurry of dust with those expectant faces about to burst into a welcome song. The answer: they know because of the number of big vehicles and crisp Kampala people arriving to spend the week with them; now make them feel the season and remember it with something you consider small but for them is MASSIVE. It made sense for me to be on the road with ten empty jerry cans just after five o’clock on Friday morning because: a) I don’t listen to local radio much anymore, and b) my domestic employment policy is very much unlike Google’s. Explaining a): I dropped off the FM station radar a while back because the one segment of the day when I would be sure to be tuned in to FM chatter began to involve my children being in the car with me, and they became of an age where they would actually listen to what people on the radio said. At first, I’d be quite aware of the moment when these radio presenters would be just about to burst into profanity or lewdness, and I was practiced at raising my voice while turning the radio volume down. Most of the time, though the joke and story on FM stations here are salacious, or based on some personal ‘relationship’ issue with inane solutions being offered up by the presenters, or focused on some American or European issue. I therefore could not intervene often enough, and very much aware of the risk of dumbing children down so early in the morning and in their lives, I switched off the radio and started them off on offerings from my CD collections, downloaded podcasts (including a Ugandan one by Mister DeeJay) and the BBC. As such, I missed all radio announcements about a water shortage this weekend. Explaining b): Google employs the most intelligent people they can find, through a rigorous, painstaking and very detailed process, then pay them very, very well. Because of my failure to employ domestic staff in this manner, my oft-repeated instructions to them to keep filling our emergency water receptacles, aka jerry cans, and ensure that the water stored within them is clean, keep getting ignored along with many other things I say, request for and order. Also, even though they spend the day listening to FM radio broadcasts, none of them heard the announcement regarding an impending water shortage. As such, on Friday morning there was only half a jerry can of water for the entire household to share around covering ablutions and breakfast, and I was soon groggily driving down Jinja Road. I circled various places till I woke up and realised that I had no idea where to get water from in the event of a shortage – the National Water offices. But which ones? I drove in the general direction and then, voila! There was a water tanker, aka bowser, driving right towards me. I flagged them down frantically, and they were all too ready to stop the car and hop out to talk with me. “Just follow me,” I said, ultra-polite and hopeful that I would not be having a smelly day ahead, then gave directions. So THIS is where people get water in this town! 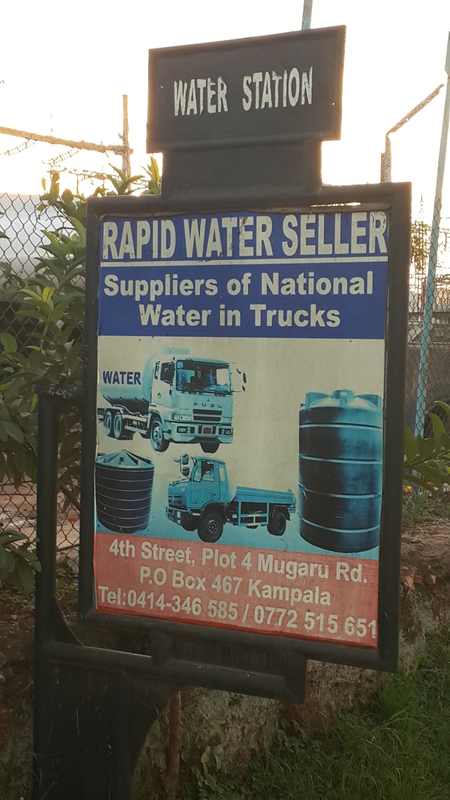 I had seen these water bowsers before, of course, but not here – parked at various odd swamps around Kampala piping water into the tanks! I had sworn NEVER to get involved in their disease generating activities. But now, what was I to do? When the fellow eventually returned, thirty minutes later, I knew for a fact that he had been at a swamp filling up his tank. “Where did you get the water from?” I began my interrogation. I paused and gave him that quizzing look. He paused and gave me back that look that indicated that I was just being foolish because there was no way I was going to prove otherwise, I had no water and would have none till Sunday, and if I didn’t swallow his story then I would have to just go to hell. It was a very eloquent look. I emptied my Milton’s steriliser and the deal was done. 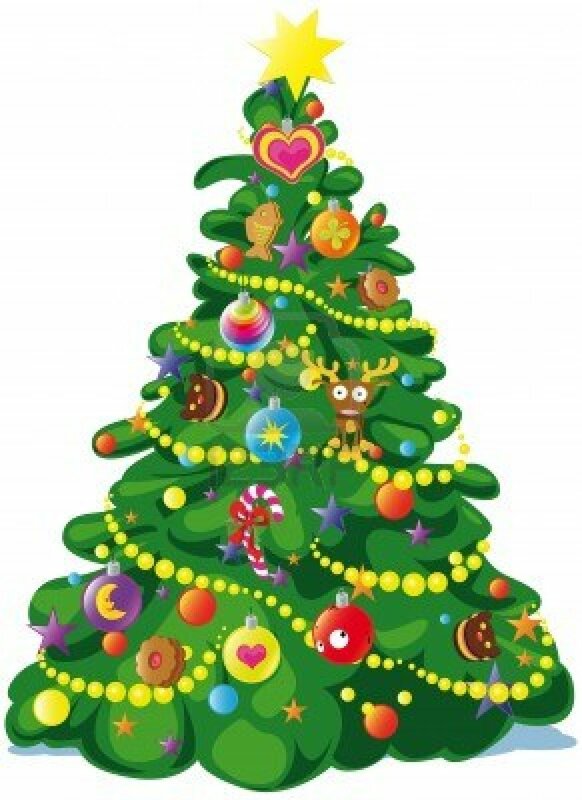 But I am still asking: What is everybody else doing? Do you all have 10,000 litre tanks at your homes? Do you also have bottles of Milton’s lying around the house to sterilise swamp water? FOR months, I have been bumping into stories on the internet about people in places I have never heard of running projects and missions to save Ugandans.We are really in need as a nation, these stories all say. A couple of months ago I found teenagers on Instagram organising a car wash in San Diego or somewhere to fund their “humanitarian mission” in Uganda. I asked for more details and offered them US$10 each but they didn’t respond to me. Eventually, I found them again and discovered that they had raised $400 for their charity, but before I could jump down anybody’s throat I discovered that their organisation was bigger than it first appeared and these weren’t teenagers using our national name to cop a free holiday. Their organisation, ‘Restore Leadership’, is funding both a primary and a secondary school, Restore Leadership High School, in Gulu, which are actually operational and frequently update the website http://www.restoreinternational.org. First ignore that, “Hungrier than anything I’ve ever seen in Africa” because it has clearly joined idioms such as “White as snow”, “Green as grass” and “Bright as day”; BUT there was a Ugandan woman who handed in beans instead of money in church?! Yes – of course. It’s on the internet. And that Ugandan woman is YOU. Images we see every day and drive by in our second hand cars, raising dust or splashing muddy water as we trundle along. Images of YOU. Then, I landed on Durango, which you won’t have heard of unless you are from Katosi village in Mukono. Durango is in Colorado, the United States of America, from where a couple once visited Uganda and donated US$200 to a project in this Katosi village to “save” women there. Visit the website and you will see shiny clean Ugandan children playing soccer in their Durango-donated t-shirts from the Durango Youth Soccer Academy. That’s YOU in those free t-shirts. Mind you, this is a very different project from that featured in the article, ‘Durango Man’s Mission Is To Build In Uganda’, which details how 26-year old Riley King has built a school and clinic in Mweruka (I don’t know where that is) at the behest of brothers Solomon Muteb (sic) and Benon Kizito. Riley King raised the money by playing in his band, holding events at his local bar and showing movies in Durango. Yep – Riley King is out there saving YOU with care and medications never available to you before. Just as ‘Threads of Blessings’ does, a US programme that teaches Ugandan women embroidery skills that they never had before but now saves their lives by giving them a living. This programme holds an annual workshop and “more than 100 women from seven regions” attend. Reading this report conjured up images of groups of black people sitting around in dusty patches chanting songs and waiting for a white woman in a safari suit to show up and teach them how to sew, saving their lives. And so, I tweeted when I came across the embroidery story, “This is about YOU, Ugandans” because the positioning that the story writer gave us put us all in one pot: you and I reading the story, the woman in Gulu and the one from Mukono who took a 12-hour bus ride to learn embroidery at that workshop, the celebs photographed drinking whisky in nightclubs, the political leaders in four-wheel drives, everyone who is Ugandan. Because YOU don’t know how to embroider things to sell them to the US – in spite of our having had AGOA I and II running for years (what happened to that, by the way? ), and your great, great, great grandmother used to make barkcloth. Even off the internet, in our very own newspapers we have evidence of our being saved; you might have missed the story in The New Vision this week titled, ‘Envoy lauds school gardening project’ where the Netherlands Ambassador to Uganda, Alphons Hennekens, applauded parents and students in Nebbi District for “embracing school gardening as a strategy for food security and retention of children in schools”. We are obviously too stupid to think of this ourselves, so thanks to donors such as the government of the Netherlands, we now have gardens in some schools in Nebbi. That US$200 here and US$400 there makes you look poor, with photographs of you ragged and in dusty patches. But then again, You are poor. Still, You should compare that US$200 here and US$400 there sent to ‘save’ you, with the money that You send over there by spending on finished goods, designer labels, second hand clothes, visa fees. I SWUNG across two extreme ends of a reputation spectrum last week during a couple of days spent in Botswana. The first end was at the very top of the Tswana society at a reception hosted by the Honorary Consul of Finland to Botswana, but the compliment itself came from the humblest man present, a very old, wizened, soft-spoken gentleman manning the bar. I’d introduced myself to a few people at the Reception, and every time I declared my country of origin the response was the same, excited exclamation, accompanied by the summons of the nearest Mtswana, followed by an anecdote. I managed about four self-introductions then realised the night would end without my having said much else other than name and country. So I took a small break away from everybody else, and this old waiter hobbled over to me obsequious like and positioned himself at my left shoulder. They were so extremely excited to be linked to Makerere University and were keen to know how it is faring these days. Luckily, the excited discussion never went beyond their own anecdotes around Makerere otherwise I would have had to say something about the University and how it is performing today – which would have led them to work out why the University was so popular back in their days of study in the 50s and 60s, but may not be taking in any of their children right now. Still, I was quite tickled that I had also been to Makerere and could bask in its glory in a place as far away as Gaborone, with the richest man in the room and the humblest both singing praises. I swung to the other end of the spectrum as my mates silently read the story in a little astonishment because their experience of Ugandan men thus far had been spending time with me, so they had hitherto held the country in fairly good esteem. A couple of them who had heard the furore the night before over Makerere had nodded their heads silently, and now stole glances at me as they read the story of the Ugandan fellow who had disfigured his girlfriend to the point of getting to Page One. 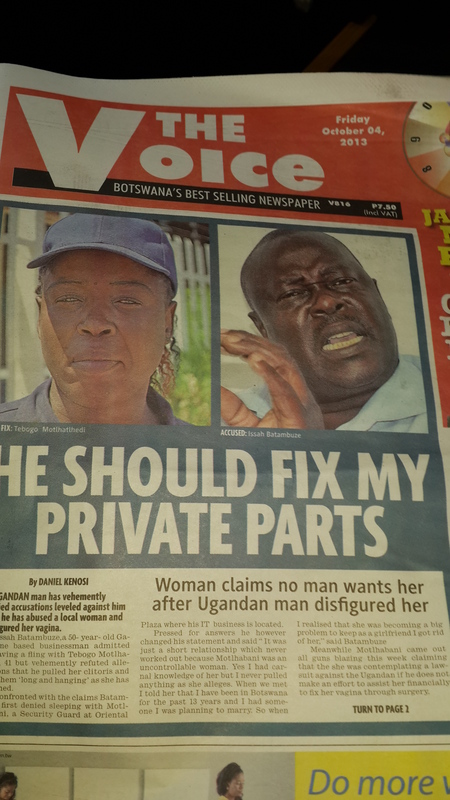 The lady, said the story, was a security guard at Oriental Plaza where Batambuze’s IT business is located. The story went into incredible detail about the goings-on between this Ugandan and his girlfriend the askari, all of which threatened to dent my standing with the people I was travelling with, but I kept head high and did all the right things to maintain the reputation we had grown over time from the days when Makerere was the greatest institution of learning on the continent. All the while, I was keenly aware how suddenly one’s reputation can be deeply affected by people one may have never met before but to whom we have that one inalienable connection – we are all Ugandans; the people who made Makerere such a great place so many years ago that old men in Botswana emotionally sing its praises today, and fellows like Batambuze. Luckily for me, my group wasn’t going to judge me loosely on the basis of the businessman and his sexual arrangements. But for the rest of my trip I worried: “Did that old bartender at Ambassador Mpuchane’s residence read The Voice or were we, as a nation, going to lose him to the shenanigans of this IT businessman and his askari girlfriend?